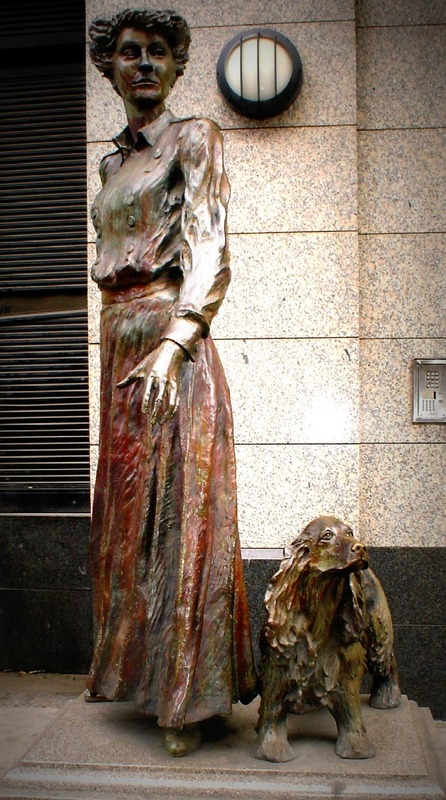 Statues of Dublin: Constance Markievicz and Poppet, Tara Street. | Come Here To Me! Statues of Dublin: Constance Markievicz and Poppet, Tara Street. 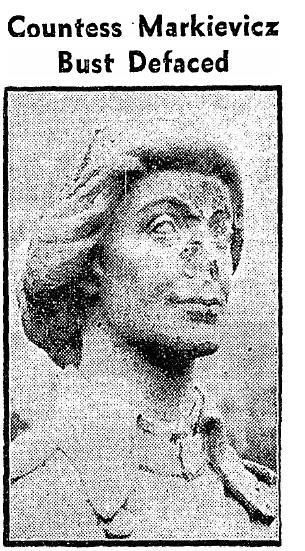 Elizabeth McLaughlin’s statue to the Countess Markievicz was slammed in The Irish Times of October 21 2000 by Robert O’Byrne. In a piece looking at five ‘statues to forget’, it was noted that the statue “bears almost no resemblence to the rebel Countess, it is coarsely executed, a giftshop item enlarged”. Ouch. Still, the writer also thought that John Henry Foley’s masterpiece, the O’Connell memorial, was “vulgar, overblown and overbearing”, and even praised ‘Perpetual Motion’, that weird looking thing out by Naas. The statue of Countess Markievicz is relatively new, dating back to 1998. It was commissioned by Treasury Holdings. The Countess has a number of statues and monuments in her honour, including at Leinster House and Stephens Green, along with a very impressive statue in her native Sligo, depicting her in the uniform of the Irish Citizen Army. What is unusual about the statue opposite Tara Street fire station and next to The Irish Times, is that it shows Marckievicz in a more informal manner, alongside her beloved dog Poppet. 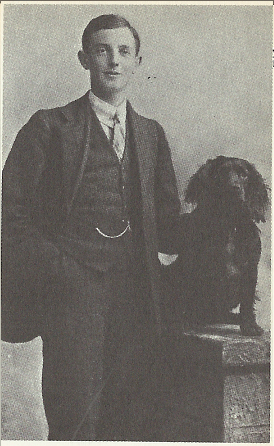 The dog also appears in the memoirs of Margaret Skinnider, the only female wounded on the republican side during a Easter Rising, and a republican from Coatbridge,Scotland. One day the countess took several of us, including her dog Poppet, out beyond Dundrum. Upon our return we could call this expedition “a little shooting party.” And it would be the truth, for Poppet, being an Irish cocker, more interested in hunting than in revolts, joined himself to two men who were intent on getting birds. He was of so great assistance that these men, in recognition of his services, gave us a few of the birds he brought in. We took them home as trophies. Constance’s stepson Stanislas with Poppet. 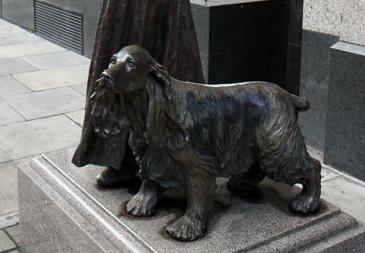 While the statue dates to 1998, monuments to the Countess have stood in the city for decades. 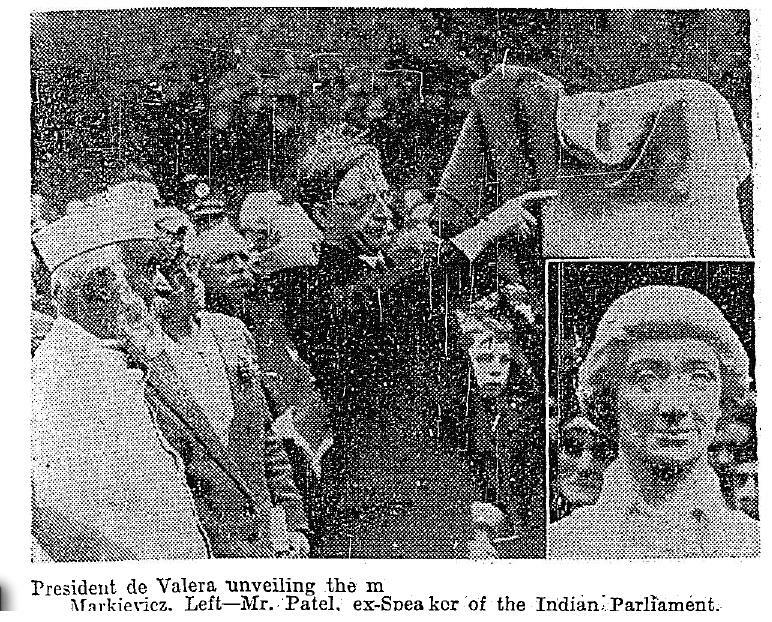 It was 1932 for example when the bust in Stephens’ Green was unveiled at a huge ceremony involving veterans of the Rising, President de Valera, and an ex-speaker of the Indian Parliament in the form of Mr.Patel, who received a rousing reception. Early in 1945, someone took a disliking to the bust and a hammer was used upon it, causing considerable damage. Constance Georgine Markievicz is today buried in Glasnevin Cemetery, having died at the age of 59, on 15 July 1927. She, and her sister Eva, a radical in her own right and a trade unionist and suffragist, are remembered in W.B Yeats’ beautiful poem In Memory Of Eva Gore-Booth And Con Markiewicz. A pedant writes: the statue near Naas is called _Perpetual Motion_, it’s by Rachel Joynt and Remco de Fouw. these make a great series, keep it up. The painting in the Dail is surprising as it depicts her, not in battledress, but evening dress, a very feminine painting, lovely. I saw it once on a tour of the houses of the Oireachtas. My grand uncle PJ Medlar had a glass panel in the lid of his coffin (1949) which he is reputed to have requested as a sort of homage to the Countess. I have not been able to find a reference to such a panel in her coffin but they were not all that uncommon at the time. I have to agree with O’Byrne. This is the product of a sweat shop industry and institutional power. Her representation, out of her typical fighting dress serves to dilute and deny her accomplishments in the struggle for sovereignty and freedom.